Phillip was one of the first pure passers to play in the NBA and became the first player to lead the league in assists twice. After a solid career at Illinois Phillip entered the NBA draft and was picked up by the home town Chicago Stags who were just coming off a defeat in the NBA finals. Unfortunately the Stags never seen that kind of success again and after 3 years disbanded. Phillip enjoyed a solid career with the Stags averaging over 10 points a game in each of his three seasons there. He was selected by the Philadelphia Warriors in the dispersal draft in 1950. Phillip would make the all-star that year, this was also the first all-star game in NBA history, and Phillip would make it for the next 5 years as well. Phillip enjoyed a lot of success with the Warriors and was a very popular player but due to financial problems the team solid him to the Fort Wayne Pistons part way through the 1952-53 NBA season. Phillip joined an already packed Pistons team with stars such as George Yardley and Larry Foust. In the 54-55 season the Pistons made the NBA finals and took the Syracuse Nationals to 7 games. Game 7 of the 1955 NBA finals is one of the most controversial games ever to be played in the NBA and Phillip has a lot to do with it. Phillip turned the ball over with 3 seconds left and the Pistons trailing by one which allowed the Nationals to win the NBA title. Teammate George Yardley accused Phillip of throwing the game because he had had bets on the outcome. The accusations of corruption were never proven but it had an effect on Phillip’s game. His production dropped the following year and though the Pistons made the finals and lost again his days in Fort Wayne were numbered. Phillips would join the Boston Celtics the following year and become Bob Cousey’s backup. 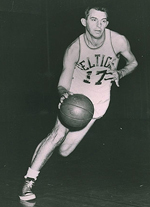 The Celtics won the 1957 NBA title, the first of 11 in 13 seasons, and Phillips would retire from the NBA. Two years after he retired from the playing he got a 10 game stint as the head coach for the Saint Louis Hawks going 6-4. He would never coach again. He would be elected to the basketball hall of fame in 1961. Phillip died at his home in California in 2001.